As Lake Superior sits still in an icy slumber, the lake’s aquatic life hides anxiously below the surface, ready to thrive in warmer waters for another year. Among these are the dormant eggs of the spiny water flea. Donn Branstrator, a professor in UMD’s Biology Department and specialist in invasive zooplankton, explains what the spiny water flea is and how it affects Lake Superior’s aquatic food web. “It’s a member of the phylum called arthropoda, which includes insects, spiders and crustaceans," said Branstator, as he observed a vile of spiny water flea exoskeletons preserved in ethanol. "What that means is that it has an exoskeleton that must molt in order to grow." The spiny water flea arrived in Lake Ontario in 1982 and spread to all of the Great Lakes by the late 1980s. The spiny water flea does not have a direct effect on humans. It is not harmful to swim with or ingest fish that feed on them, but they do shift the biodiversity of the ecosystem. Since this species is carnivorous and eats other zooplankton, it presents problems for other native species that are trying to survive. “Oftentimes there are no natural predators, parasites or competitors to keep their population in check,” Branstrator said. This is what makes the spiny water flea such a troubling invader. The population grows so quickly that it has an environmental impact on the ecosystem. With no natural predators, the rapid growth of the spiny water flea can cause problems for certain species of fish. Small bait fish avoid feeding on it due to a long barb-like tail spine that runs down its body. The regulations of cleaning recreational equipment and boats will undergo some serious changes because of the spiny water flea's effect on the local fish population. “We think the way they’re getting around from lake to lake is by ensnarement on fishing lines," Branstrator said. "The females get ensnared on all sorts of recreational equipment. It might be anchor lines as well, or the mud impacted on an anchor." “In the fall, the females can sense a drop in temperature and a decline in food, and they make males," Branstrator said. "Then, they mate with the males. So there’s this period of sexual reproduction in September and October, and the end result of that sexual reproduction is an over-wintering cyst or resting egg." Spiny water flea eggs are not only resistant to cold temperatures but all sorts of environmental stress. “You can put them in chlorination for a few days, and they can survive that," Branstrator said. "You can expose them to salt water or warm temperatures, and they survive that. They’re really durable. They’re believed to be the life stage that helps facilitate dispersal from one location to the next." The key to prevention is to find the resting egg’s Achilles heel. There is one thing these over-wintering cysts are not good at overcoming. “The eggs of this species are not very resistant to drying at all," Branstrator said. 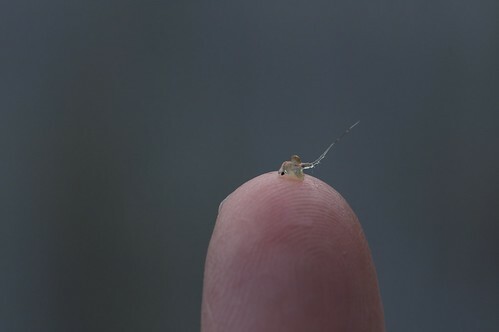 Branstator’s research of the spiny water flea has helped the DNR Fisheries Office create standards for how recreational boaters and fisherman should clean their equipment to prevent the spread of invasive species to other Minnesota lakes. Fisherman are advised to be careful not to spread these invaders to other lakes to protect the biodiversity of the aquatic ecosystem.